Separatism is a Communist tactic with a view to fragmenting nations with a view to communizing parts or all. My exclusive English translation of Quand nous serons vraiment chez nous, the 1972 manifesto of the Parti Québécois for a Communist state of Quebec, is almost complete. Only about 10% remains to be done; it has been drafted, and needs to be polished. Please visit the sidebar to read the English version of this hidden Communist plan to use Quebec to dismantle Canada by taking the powers out of Parliament for use by the new Communist country of Quebec. It is also very important, before you read the manifesto, to read the CBC Radio Roundtable of the same year, 1972, discussing the manifesto. This makes it absolutely clear, from the criticisms brought by professional employers and business people, that the PQ manifesto is Communist, on the model of a Soviet satellite in Eastern Europe. Then read the manifesto. Obviously, people who have been pretending to be “separatists” are not separatists at all, they are Communists. If we look up the background of René Lévesque, for example, it’s obvious that he is a Communist. He was known to be a Communist at the time he first ran for election, and for that reason, he had a hard time getting in. However, other people have been portrayed as “separatists” or as “federalists” over the years, who really are Communists. Language has been abused in order to shield them, and to obscure the fact that they are not “opposed” to each other, but are working together from seemingly opposite vantage points. It’s a bit like the dunking you might get at a birthday party. Someone grabs your feet, someone grabs your shoulders, and while you are helpless, they rush to the water’s edge and toss you in. Founding of the Communist Parti Québécois with René Lévesque and Guy Bertrand. Bertrand is in the middle, right behind the sign. Lévesque is to his left, which is right in the photo. Communists have grabbed the feet and the shoulders of the country, and are rushing to toss it into the new regional pool. They are all after the same thing: dismantling Canada, dismantling the Provinces, dismantling the Territories, destroying the Provincial and Territorial Legislatures and the last vestige of the Parliament, for a regionalized, Sovietized, continental, multicultural regional union that has nothing to do with the British North America Act of 1867, and will end in the full recolonization of Canada and the destruction of its Founding Peoples. Quebec City lawyer, Guy Bertrand, who has been infamous with his “separatist/federalist” flip-flops, pretending in 1995 that he had “changed sides” to defend Canada against the 1995 referendum in Quebec, is neither “federalist” nor “separatist” but Communist. 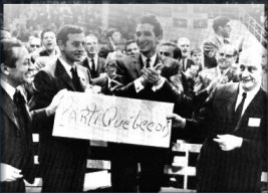 This is clear because he is a co-founding member of the Communist Parti Québécois with René Lévesque (see the photo above with Bertrand right behind the sign at the moment of founding the Communist Parti Québécois). He ran for the leadership of the Communist Parti Québécois in 1985. You can match the face to his portrait on the red, white and blue election poster, scanned above. I also know for a fact that Bertrand’s 1995 “law suit” is a farce and a fraud. 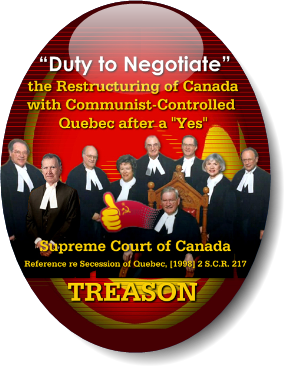 It was part of a tactic, together with the Communist-controlled Parti Québécois, and their aiders, abettors and allies at the federal level, in order to manipulate the appearance of “law” to entitle Quebec to international state recognition after an expected “Yes”. I have studied Guy Bertrand’s so-called law suit1 in depth. One of the judges used in that fraud is a man who actively participated behind the scenes in the first major stage of the final overthrow of Canada — the fraud of the so-called “patriation” of 1982, which was not a patriation, but a constitutional and parliamentary coup d’état. I’m referring to Quebec Superior Court judge Robert Lesage who took part in the Canadian Bar Association’s criminally seditious “Committee on the Constitution” from 1976-1979, financed largely by a tax-free foundation, and stage-managed by Rhodes Scholar and future judge of the post-coup Supreme Court of Canada, Gérard Vincent La Forest. You’ll find the name Robert Lesage, Q.C. (Quebec), cited by La Forest in the article penned by Rhodes Scholar La Forest describing the work of that committee for the September 1979 issue of the Canadian Bar Review. (See the footnote at page 494.) The Committee’s project was called “Towards A New Canada“. La Forest’s article in Volume 57 of the Canadian Bar Review, (journal of the non-governmental Canadian Bar Association), was entitled “Towards A New Canada: The Canadian Bar Association’s Report on the Constitution“. You can also read it online at the web site of the Canadian Bar Association if you have a university library account. 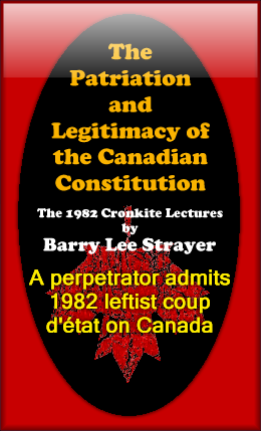 The fact that the patriation was indeed a coup d’état is admitted in his own words by a chief architect and adviser to the coup executive, Barry Lee Strayer, in a pair of lectures he delivered to a College of Law within months after the 1982 coup d’état. You can read those lectures online, with my introductory comments: Patriation and Legitimacy of the Canadian Constitution. And it was a coup d’état of the Left, all linked to the Communist world-government crowd at the Socialist International (SI), including the New Democratic Party of Canada (NDP) which has held executive positions in the Red, Red, Socialist International. If you search this present web site, you will also find information on the Socialist International, and the ties to it of the Parti Québécois. I have in particular translated an article on the subject by Philippe Poulin, “Attempt of the Parti Québécois to Join the Socialist International,” on which I will one day post a few comments. And you will find at this present web site René Lévesque’s 1982 letter to the Socialist International, seeking entrance of the Parti Québécois. 55. Celui qui forme une demande en justice, soit pour obtenir la sanction d’un droit méconnu, menacé ou dénié, soit pour faire autrement prononcer sur l’existence d’une situation juridique, doit y avoir un intérêt suffisant. 55. Whoever brings an action at law, whether for the enforcement of a right which is not recognized or is jeopardized or denied, or otherwise to obtain a pronouncement upon the existence of a legal situation, must have a sufficient interest therein. 1965 (1re sess. ), c. 80, a. 55. 1965 (1st sess. ), c. 80, a. 55. If you don’t meet that legal requirement of “sufficient interest“, you therefore do not have a “law suit”. Your documents, which you have filed into court, regardless that you paid for a court stamp, regardless that they have all been rubber-stamped at various desks, regardless that a bailiff may have claimed to “serve” it (there is no “legal service”, either, where there is no legal “interest”), regardless that a name or citation is given to the file in official courthouse records, it remains nothing but a file folder full of documents. It has never become a “law suit” in the legal sense, and therefore can never attract the jurisdiction of the court to deal with it, because you have no personal, immediate and existing “interest”. There is plenty of case law in the library to explain what “sufficient interest” means in Quebec law. Ask a reference librarian for the annotated volumes on Code of Civil Procedure/Code de procédure civile. A thorough analysis of Mr. Bertrand’s 1995 file indicates he has no “interest”. Therefore, the also spurious “judgments” of Robert Lesage, and of Judge Robert Pidgeon in that file, are legally non-existent because they never had jurisdiction in the absence of “legal interest” — meaning “sufficient interest” — by Mr. Bertrand. Mr. Justice Gérard Vincent La Forest — another of the 1982 coup plotters who got himself a high judicial job under the “new” constitution he himself helped to impose on Canada. As to Mr. La Forest and the CBA committee’s “Towards A New Canada” of 1979, there is no legal authorization in the lawful British North America Act of 1867 to replace Confederation with any other entity, including one so vaguely referred to as “A New Canada”, and obviously meaning Communism. In addition, the La Forest-CBA project of “A New Canada” was intended to “constitutionalize” (impose) multiculturalism as Canada’s “New Constitution”. Multiculturalism is Soviet-Zionist, not British North American, and manifestly not “Canadian”. It is the hijacking of Canada by the “New World Order” for ends opposed to Confederation. It destroys the self-government of the Founding Peoples of Canada, established for them permanently in 1867. If you are interested in the true constitution and the rights of the Canadian Founding Peoples, you may wish to visit the web site of the Alliance of the Founding Peoples of Canada / Alliance des peuples fondateurs du Canada, and subscribe. For other language and ethnic groups far less can be done as a practical matter, but the Committee felt that in addition to the preambular statement on multiculturalism, the constitution should explicitly recognize the right of the federal and provincial legisla­tures to assist these groups in promoting their languages and cultures. Why would a lawyer who is attempting to influence the draft of a new imposed constitution say that? Precisely because he knows very well that Canada belongs to the Founding Peoples of the country for whom the Provinces were created in which they were the local majorities at the time, and should still be today. Canada is legally an ethnic federation. Whether the United States of America is also legally an ethnic federation, I couldn’t tell you; but Canada is, and that is the basis of our rights, because the purpose of Confederation was to preserve us and our cultures for all time. That fact is all over the Hansard (Debates on Confederation of 1865) and the other relevant history of the British North America Act. Now, the local or Provincial Legislatures are legal jurisdictions belonging principally to the ethnic majorities who obtained them at the time of Confederation. The purpose of these legal jurisdictions is the preservation, promotion and self-government of each of the Founding Peoples, without undue external interference, i.e., from other cultures and ethnicities. That was the whole point in 1867. Lawful immigration can therefore only be assimilative of the immigrants; it cannot be used the other way around, to assimilate the Founding Peoples into a new multicultural system. The constitutionally lawful use of these legislative and governmental jurisdictions can therefore only pursue the preservation and self-government of the Founding Peoples. Rhodes Scholar Gérard Vincent La Forest and his CBA “coup committee” therefore knew that “copying and pasting” the constitutional structure of Confederation into the upcoming “New” constitution would not alter these legal jurisdictions and their purposes. It would alter their constitutional sovereignty and change their character, and subject the Founding Peoples to the “government of judges” under the “new” Charter, but it would not authorize any legislature or government in Canada to govern for the sake of the preservation and promotion of other peoples; in particular 200+ foreign races and their cultures whom these Reds planned then to mass-immigrate; and whom they have indeed mass-immigrated. Those words required by La Forest were never added to the “New” constitution of 1982. Why they failed to stuff them in at the time of the phony “patriation,” I don’t yet know. But they did fail. There is therefore neither “preambular statement” nor “explicit recognition” of “the right” (“right” means constitutional power) of the federal and provincial legisla­tures to “assist” mass-immigrated groups of hundreds of other races in promoting their languages and cultures. Foreigners have no “Confederation” here. If they can be assimilated, they must be assimilated, or there is no place for them. Quebec and a few outlying areas in New Brunswick and Nova Scotia is all that remains of New France. Quebec — all of it, not just a corner in the Gaspé — belongs principally to the French-Canadians; secondarily to the other Founding Peoples who were a minority in Lower Canada (Quebec) in 1867. Confederation belongs to the Founding Peoples for our benefit. This is the only country we have; these mass immigrants already have countries elsewhere. Moreover, they outnumber us, in some cases more than a million to one, in those countries. They are not endangered species; we are. The Founding Peoples of Canada have no obligation to destroy ourselves, our country, our culture, our Constitution, our Parliament, our Legislatures, and our respective unique institutions of 1867, to serve other people and other purposes. As a consequence of the complete lack of express language in the “new” 1982 coup constitution to such effect, meaning the complete absence of either a “preambular statement” or any words to authorize all the various provincial and federal “departments” or “ministries” to cater to the mass-immigrated newcomers, and to “multiculturalism” and to “interculturalism,” their doing so is “unlawful” under the coup constitution. And it could never be lawfully done under the British North America Act, 1867. The BNA Act was and still remains Canada’s only lawful Constitution, for whose true Parliament and Legislatures the proper writs have not been issued in many a year. Brian Mulroney, signer with veiled Communist and Rockefeller mouthpiece, Red Ronald Reagan) of NAFTA (the latter being a stage toward North American Soviet regional union), once appeared on TV and ripped up the “constitution of Canada”. Well, he can rip up his 1988 so-called “Canadian Multiculturalism Act”2, which is a fraud and VOID because there is nothing in the constitution — either in the coup constitution or in The Real Constitution, on which to pin it. Notably, there is no express power to pass it, as it undermines and destroys the rights of the Founding Peoples of Confederation. 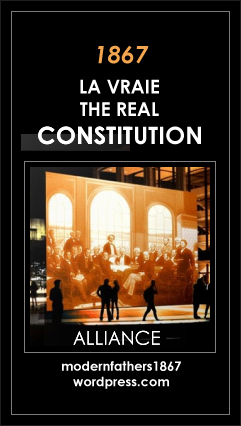 The true Constitution needs to be restored in order to restore lawful self-government of the Founding Peoples of Canada to whom the Provinces and the Parliament legally belong. I got off on a tangent — albeit an interesting one — with respect to coup conspirator, Robert Lesage. Now, back to Guy Bertrand and his plan to convert Quebec to a Communist-style regionalized federal republic. 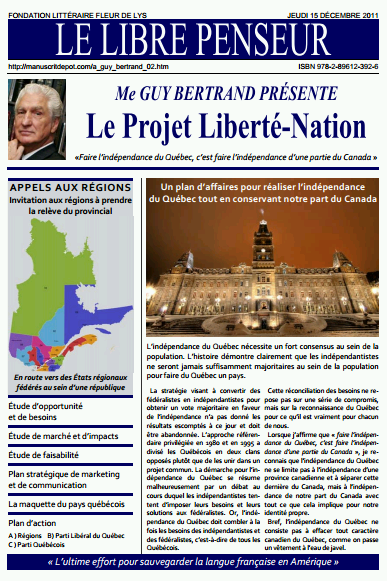 On Monday, 8 April 2014, Guy Bertrand published a “New Edition” of his French book entitled Projet Liberté-Nation, subtitled: “Plan d’affaires pour réaliser l’indépendance du Québec tout en conservant notre part du Canada“. 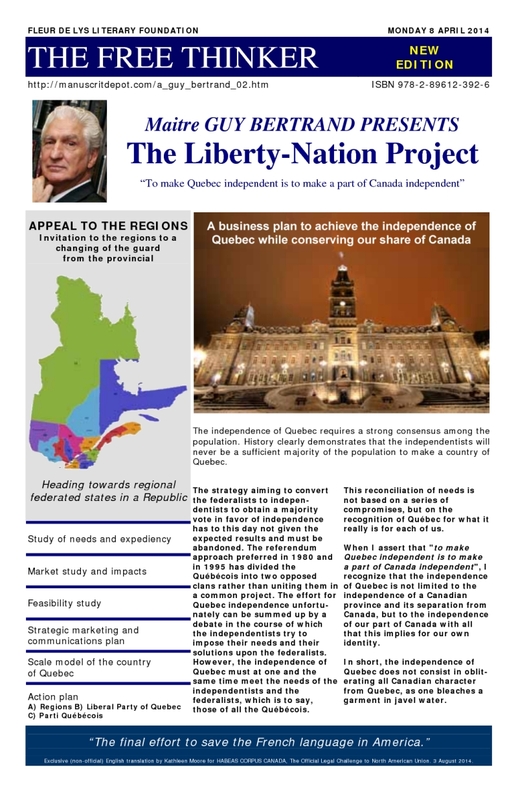 Translation: Liberty-Nation Project, Business Plan to Achieve the Independence of Quebec while Conserving our Share of Canada. At first glance, therefore, it reeks of the same old “Sovereignty Association” (1980 referendum) and “Sovereignty Partnership” (1995 referendum), whose object was to flypaper Canada into a Communist regional union by “association”. Now, the word is not “partnership” or “association” but “conserving our share of Canada“. The Reds are still trying to attach a Communist Quebec to the unconscious and snoring “rest of Canada”. 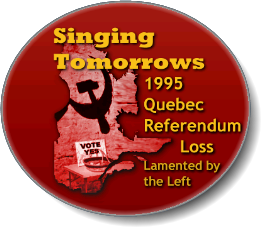 I’ve translated the book cover (next, below) so you can get the gist of what Communist Guy Bertrand of the Parti Québécois and the 1995 referendum, is up to, now. The independence of Quebec requires a strong consensus among the population. History clearly demonstrates that the independentists will never be a sufficient majority of the population to make a country of Quebec. In other words, even when they stuff the ballot boxes, they can’t win. By that, I mean: the 1995 referendum may well have been rigged. Up to a quarter million phony identities of “new citizen” immigrants are alleged to have been flooded onto the Quebec electoral roles in the handful of years leading to the 1995 referendum. Certain Quebec election workers in the office of the Director General of Quebec Elections insist that “a file exists” at the DGQE which documents the fact that a couple of hundred thousand “voters” who had registered for the 1995 referendum… had evaporated into thin air when the roles were updated two years later for the next provincial election! These workers in the DGQE, and other sincere French-Canadians, presumed that the federal government of Canada, which had supplied the identities of these “new citizens” to the DGQE, had used them to register a couple of hundred thousand “NO” votes to “save” Canada. A “secret committee” of Communist cabinet ministers from Quebec in the federal government of Soviet Agent Lester Bowles Pearson, met Friday nights in 1967 at Power Corporation in Montreal. It was they who conceived the Parti Québécois and appointed Lévesque to organize and lead it. What these people do not realize is that a “secret committee” of the Communist-infested federal Liberals, in the reign of Soviet agent Lester Bowles Pearson (Prime Minister in 1967), met on Friday nights in downtown Montreal on the business premises of Power Corporation of Canada. That secret committee created the Parti Québécois. They instructed René Lévesque to set it up as a coalition of the left and the far left, while calling it “moderate”, and lead it so that the federal level could “fight it”… in a referendum. The CEO’s of Power Corporation sit on the Board and Senate of the Canadian Institute of International Affairs (CIIA), now called “Open Canada” in honor of billionaire George Soros who finances revolutions, Communism, and his Open Society Institute (meaning no more national borders). 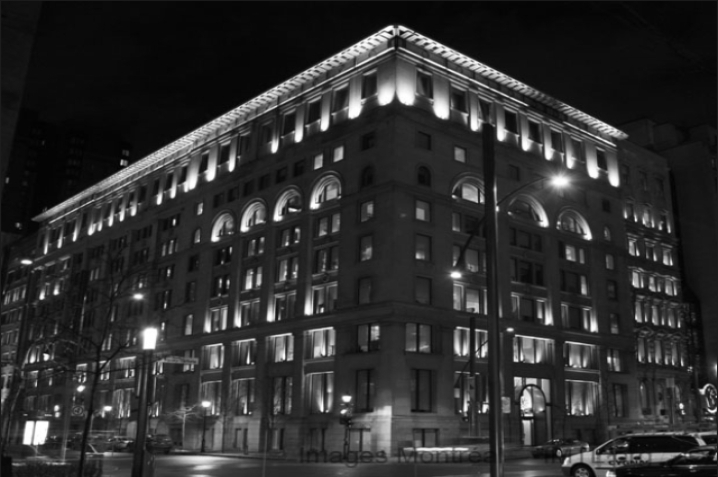 The CIIA used to brief the Reds recruited into Canada’s federal civil service and External Affairs Department by Soviet Agent Oscar D. Skelton. Among Skelton’s early recruits was Lester Bowles Pearson, who at one point became the president of the CIIA. The CIIA, as a branch of the Royal Institute of International Affairs in London (headquarters of the international bankers behind the U.N. and world government), and as the Secretariat of the Institute of Pacific Relations (led by Communists taking instructions from the Kremlin and created by the Council on Foreign Relations in the USA) — used to brief Soviet Agent Oscar D. Skelton’s Red recruits into Canada’s External Affairs and Civil Service. Among Skelton’s early recruits was Lester Bowles Pearson, who at one point became the president of the CIIA. It is the Reds up top, Pearson, Trudeau, Marchand, Maurice Sauvé and many unnamed others, who are behind the Communist Parti Québécois. They have been using it as a pretext to Communize Canada by “negotiation” to “save” “Canadian unity” after a “YES” in a referendum. 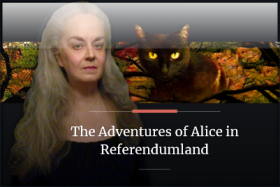 Therefore, if the ballots were stuffed (electronically, for example) in the 1995 referendum, they were stuffed by the Red Fed … with “YES” votes. Not with “NO” votes. It is alleged that the election workers who discovered the “vaporized” quarter-million 1995 “voters” were eventually required to sign promises of secrecy, and were re-assigned to other departments. The strategy aiming to convert the federalists to indepen­den­t­ists to obtain a majority vote in favor of independence has to this day not given the expected results and must be abandoned. The referendum approach preferred in 1980 and in 1995 has divided the Québécois into two opposed clans rather than uniting them in a common project. The effort for Quebec in­dependence unfortunately can be summed up by a debate in the course of which the independentists try to impose their needs and their solutions upon the federalists. However, the independence of Quebec must at one and the same time meet the needs of the independentists and the federalists, which is to say, those of all the Québécois. This reconciliation of needs is not based on a series of compromises, but on the recognition of Québec for what it really is for each of us. When I assert that “to make Quebec independent is to make a part of Canada independent“, I recognize that the independence of Quebec is not limited to the independence of a Canadian province and its separation from Canada, but to the independence of our part of Canada with all that this implies for our own identity. In short, the independence of Quebec does not consist in oblit-erating all Canadian character from Quebec, as one bleaches a garment in javel water. That “middle-of-the-road solution” is really Communism. For obvious reasons, they never use that word, or the word “dismantling”. It’s always “renewal”, as if they are just “improving” it. But what they are doing is destroying Canada. They want to remove not only the national border, but the provincial internal borders. They are changing the population by mass immigration, which affects the internal borders by blotting out the original Canadian Founding ethnicities federalized by these borders, and which these borders signify. In effect, they are eradicating the lawful Constitution by attrition — unless the Founding Peoples wake up and fight back. By 2014, when Bertrand is publishing the “New Edition” of his “Liberty-Nation Project“, Quebec has been the dumping off point for over 200 foreign races speaking over 135 foreign languages at home and on the streets. One small immigrant child told her father, “Canada’s not a country, it’s a refugee camp“. Communist Bertrand, an ideological heir and successor of Lévesque, is now trying to save, not the “economic, ethnic, linguistic aspirations of French Canada (meaning the French Canadians). Now he is trying to save the “French language in America”. In the early era of the Communist attack on Quebec, the effort was supposedly to “save” the French Canadians themselves “from” Canada. Save them, their ethnicity, their culture, and their language. Much of their culture derived from their Catholic roots. However, in the mid-1960s in Quebec, the Reds eliminated the constitutionally mandated Catholic and Protestant public schools, also called “separate schools”. This paved the way for mass immigration of hundreds of foreign races of all religious beliefs. Essentially, you can teach anyone to speak French, but the authentic culture of the French Canadians had its rug pulled by Rhodes Scholars working with the left for Communist world government. Thus, the order of the day is to force all these foreigners to speak 200+ kinds of pidgin French, while distracting everyone from the fact that Communists — above and below — are dismantling Canada. As long as everyone speaks French, the Reds can still pretend Quebec is a “distinct society” (although not because it’s French Canadian) for the purpose of “international state recognition”, and “secede” to force the “rest of Canada” to “restructure itself” into the top half of the Communist regional union: the North American Soviet Union, under construction in North America for decades. However, it is lagging behind Mikhail Gorbachev’s slowly restructured New European Soviet. I studied for the first seven years of school at Saint Augustine’s of Canterbury. The school was right next door to our Catholic church of the same name, whose bells could be heard ten blocks away in bed, every Sunday morning. I wrote the script and drew the initial cartoon slides in 2011, intending to make a video. Then my Dell D600 hard drive crashed. I therefore had to learn (a) to repair my own D600 with second-hand spare parts and “How To” videos from YouTube, (b) instal Windows XP Pro SP3, (c) configure all my own programs, and finally, (d) use various kinds of recovery software to rescue my files from crashed hard drives. It took me until late in 2013 to recover the drive that crashed in 2011. Among the treasures that I dredged back up was this old, incomplete animated video, a Child’s View of Trudeau. Only two minutes of the video had been finished out of the 8-10 minutes planned. It would take too long right now to finish it, so pardon me if I grab a few slides to illustrate the gist, and give you the script, below. Animation and cartoons aside, this is a real story about The Real Pierre Elliott Trudeau — A Child’s View in Retrospect. When I was about 12 or 14 years old, and home from school for the afternoon, I switched on our old black and white floor-model TV, and there was Pierre Elliott Trudeau. This would be around 1965-1967. Trudeau was not yet Prime Minister. As I was not a political kid, I couldn’t tell you what he was at the time. 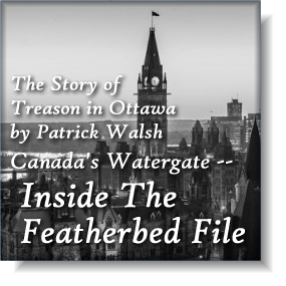 But, from my reading today, I would say that during that broadcast, he had probably already been recruited by Soviet spy, Prime Minister Lester Pearson, and had been or would soon be elected to Parliament as a so-called “Liberal” and enter Pearson’s cabinet. This was on channel 6 or 12 (CBC or CTV in Montreal, Canada). We had rabbit ears and picked up only channels 2 and 10 (which were French), and 6, 12, 3 and 5 (which were English; but 3 and 5 were American, ABC and NBC). So, there was Trudeau in a suit being interviewed. He was describing his ideal society. And, again, looking back, he must have been testing the waters; for, as he never openly discussed it again, in these terms, he must have decided that viewer response was not sufficiently favorable to openly inflict Communism on Canada. I know I remember this pretty well, because after the show, I quickly descended the basement stairs of our wholly-owned non-mortgaged duplex at 2264 Hingston Avenue in NDG to the old Underwood manual typewriter, and I wrote a funny story about Trudeau’s ideal society. I called my story “CLANADA”, with an “L” in it; that’s not a typo. However, back to Trudeau — and keep in mind, I could write this as an affidavit. In Trudeau’s ideal society, there would be no private property. You would own nothing. You would not even own the chair you sat in to watch Mr. Trudeau on television. And obviously, you would not own the television. Because, said Trudeau, there would be no stores. You could not buy things any more. Instead, you would go to a central warehouse run by the government where you would receive all you need, which is to say, all that government decided you need. You would exchange a chit for this, which the government had issued. For example, said Trudeau, in this warehouse there would be only a few models of couches, beds and chairs, and a limited assortment of pictures to put on your wall. The purpose of this limitation in style and variety was “equality”. Said Trudeau, people would be “equal” only if they all owned nothing and had the mere use of pretty much the same “things”. Keep in mind, this is coming from a man who when he finally left the home owned by his mother, bought himself a mansion which he later fitted with an indoor swimming pool. Newspaper columnist Peter Worthington suspected the pool was at Canadian taxpayers’ expense, although it was said to have been a gift of wealthy businessmen. (If the latter is true, perhaps the wealthy capitalists were “equalizing” one of their own with themselves.) Therefore, Mr. Trudeau, his wife and his own children, did not have to mingle with the “equal” people at the low-brow community swimming pool. Mr. Trudeau certainly did not live the lifestyle he recommended for others. One would therefore have to think that Trudeau did not consider himself “equal” to others. Apparently, in his ideal society, he would be “more equal” — as no doubt would friends of his who also lived up the hill in pool-equipped mansions, or in posh Westmount homes. As a kid, I didn’t know what Communism was, so I really just thought Trudeau was crazy. The story I wrote was of Trudeau’s ideal country, where you didn’t even own the bed you slept in. Moreover, in my story, you had to share your bed with a neighbour, because it rolled through the wall in the morning, into the next apartment, to be slept in by someone else coming home from his shift at the workplace. A new segment of my exclusive English translation of the 1972 manifesto of the Parti Québécois for a Communist state of Quebec has been added to the Library tab. Pages 29 through 38 cover two chapters and contain some startling information for researchers into the “New World Order”. As we might fully expect from various stripes of Communists, personal liberty is on its way out; yet the manifesto equates the “new social model” with freedom and “fertile self-determination”. The rather chilling spectre hovering perceptibly across these paragraphs is the implication of some kind of State-imposed and State-enforced individual and group (“community”) “evolution” in the Darwinian sense, which in my mind seems to invoke the 1946 Unesco: its purpose and its philosophy, penned by Julian Huxley, brother of Aldous (the LSD researcher and author of Brave New World, 1931), calling for some kind of worldwide controlled human “evolution” to a higher stage. My impression of this potential link of the 1972 manifesto to the UN is underscored by the fact that the tactic of setting up the Parti Québécois emerges from the same nexus of people around Cité Libre review in the 1950s, described by Quebec historian Robert Rumilly. That group were closely affiliated with the Esprit group in France around Emmanuel Mounier and Jacques Maritaine, whose names appear in a search of the UNESCO web site. I may write more about this another day. Also of interest are the various references to redesigned municipalities, and concerns with regions or regionalism. These might be expected in a Communist context where nations are gradually eroded toward a “world state” in which nothing would remain but cities and regions. Read my new English segment of the 1972 Parti Québécois manifesto for a Communist State of Quebec,(Quand nous serons vraiment chez nous). These are pages 29-38, including the chapters entitled “Political organization” and “Toward a new social model“. Unfortunately, Calaméo no longer allows free downloads. I’m trying to find somewhere else to provide these documents to you, free of charge. An exclusive English translation of the French CBC Radio show discussing the 1972 manifesto of the Parti Québécois is now on the library tab: CBC Radio 1972. This is a discussion of the Parti Québécois plan for a Communist state of Quebec, which according to the Manifesto itself will be linked to Canada, and linked to America, by treaties and other agreements. Also on the Library tab (Quand nous serons) is a 22-page segment entitled “Les objectifs économiques du Plan” – (“The Economic Objectives of the Plan”). This is Chapter 6 of the actual Parti Québécois 1972 (Communist) Manifesto, “Quand nous serons vraiment chez nous” (“When are truly at home”). Again, this is a side-by-side translation for the convenience of other researchers. Underlined sections are points for my own research; I’ve left them, as you may find them interesting. Highlighted text (black on silver) is subject to revision. I recommend you read the radio transcript first. Several other segments have been translated and will be placed online here, as soon as possible. In their French article entitled “Adhésion du Parti Québécois à l’Internationale Socialiste“, the Fédération des Québécois de Souche claims credit for a literal scoop from the archives of the Parti Québécois. And that is a scan of the letter dated December 6th, 1982, sent by René Lévesque to then-President of the SI, Willy Brandt. The letter requests full membership of the Parti Québécois in the Socialist International, deemed by sources at The New American to be an extension of the original “Communist International”. However, Canada’s New Democratic Party — currently led by Thomas Mulcair (married to his Jewish psychologist) and formerly led by the late Jack Layton — has always been a full member of the Socialist International, a status the NDP inherited from its political forebear, the CCF. My request to the Quebec Provincial Archives for a certified copy of the original letter met the response that they do not have this particular letter. The Provincial Archive suggests that the original letter must still be with the Parti Québécois. So, this really is a scoop. Congratulations to the F.Q.S.! I claim credit for the first English translation of it, and for its first publication in English, here. See below. Downloads are available at the very end. 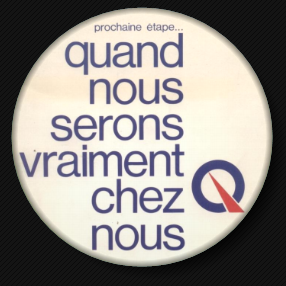 Founded less than fifteen years ago, counting more than 200,000 members, well rooted in all milieux, carried to power in 1976, seeing its mandate renewed at the time of the general election of April 1981, financed solely by the individuals who compose it, the Parti Québécois has become one of the most important mass parties of the western world, especially if account is taken of the fact that Quebec counts only a little more than six million inhabitants. Bearer of the national and progressive aspirations of the Québécois people, it intends to affirm its presence on the international scene and to multiply contacts and exchanges with political organizations of other countries which share similar objectives. In this spirit, in accordance with the wish expressed by the delegates brought together at the national congress last February, the Parti Québécois, by the resolution of its national Executive council dated November 26th, 1982, solicits full membership of the Socialist International, this absolutely essential world gathering place of the forces of progress and freedom. Condemning any authoritative and oppressive form of government, communist or fascist in nature, conscious also of the need to correct the abuses of capitalism while causing the rights and freedoms of the individual and the general interest of the community to prevail over those of privileged and too-powerful groups, the Parti Québécois adheres without any restriction to the principles stated in the declarations of Frankfurt (1951) and Oslo (1962). “To unceasingly increase the democratic level of a society. It is not only a question of theoretically ensuring fundamental freedoms and the maintenance of democratic institutions, but to make it so that these freedoms really can be within the reach of one and all and that these institutions are used to increase the freedom of those who are the most disadvantaged. What is required is thus the elimination of discrimination and of the inequalities in human relations, the abolition of all class privilege, growth in quality of life for the most disadvantaged people of our society and the broadest possible participation of every citizen in decisions which affect them”. In fact, as much by its program as by the policies carried out since it came to power, our political organism is conducting an experiment at one and the same time original and promising, unique in North America, of national emancipation, of social and economic democracy, of respect for the rights of minorities and of ethnic groups. The following initiatives in particular have been taken: a referendum on the political status of the Québécois people; radical democratization of the financing of political parties, excluding by law any participation other than that from individuals, with supplemental aid from the State; sustained efforts in order to reduce the tax burden of persons of modest income and to more equitably redistribute the collective wealth; a public and universal regime of auto insurance; extension of and new strength breathed into the public sector of the economy; measures with a view to furthering unionization and ensuring better protection for the health and safety of employees; a “Charter of the French language” aimed at ensuring equal opportunity for the vast majority of French-language Québécois workers, while recognizing and protecting the rights of the anglophone minority; decentralization of the governmental apparatus and increased participation of citizens in the administrative authorities; rigorous protection of the environment and agricultural territory; initial attempts at co-decision among the principal socioeconomic agents; and finally a Charter of rights and freedoms of the person which we believe the most progressive in America. For all the reasons which I have just evoked, I express with confidence, Mr. President, the wish that our membership application be favorably received by your management Office. Fondé il y a moins de quinze ans, comptant plus de 200 000 membres, bien enraciné dans tous les milieux, porté au pouvoir en 1976, voyant son mandant renouvelé lors du scrutin général d’avril 1981, financé uniquement par les individus qui le composent, le Parti Québécois est devenu un des partis de masse les plus importants du monde occidental, surtout si l’on tient compte du fait que le Québec ne compte qu’un peu plus de six millions d’habitants. Porteur des aspirations nationales et progressistes du peuple québécois, il entend affirmer sa présence sur la scène internationale et multiplier les contacts et les échanges avec les formations politiques d’autres payes qui partagent des objectifs similaires aux siens. Dans cet esprit, conformément au vœu exprimé par les délégués réunis au congrès national en février dernier, le Parti Québécois, par la résolution de son Conseil exécutif national en date du 26 novembre 1982, sollicite de devenir membre de plein droit de l’Internationale Socialiste, ce lieu de rassemblement mondial, absolument essentiel, des forces du progrès et de la liberté. Condamnant toute forme autoritaire et oppressive de gouvernement, de nature communiste ou fasciste, conscient aussi de la nécessité de corriger les abus du capitalisme en faisant prévaloir les droits et libertés de la personne et l’intérêt général de la collectivité sur ceux des groupes privilégiés et trop puissants, le Parti Québécois adhère sans aucune restriction aux principes énoncés dans les déclarations de Francfort (1951) et d’Olso (1962). « D’accroître sans cesse le niveau démocratique d’une société. Il s’agit non seulement d’assurer théoriquement les libertés fondamentales et le maintien d’institutions démocratiques, amis de faire que ces libertés puissent être réellement à la portée de tous et de toutes et que ces institutions servent à accroître la liberté de ceux et de celles qui en sont le plus privés. Ce qui est recherché est donc l’élimination de la discrimination et des inégalités dans les relations humaines, l’abolition de tout privilège de classe, l’accroissement de la qualité de la vie pour les personnes les plus démunies de notre société et la plus large participation possible de chaque citoyen et de chaque citoyenne aux décisions qui les concernent ». En fait, tout autant par son programme que par les politiques réalisées depuis qu’elle exerce le pouvoir, notre formation politique mène une expérience à la fois originale et prometteuse, unique en Amérique du Nord, d’émancipation nationale, de démocratie sociale et économique, de respect des droits des minorités et des groupes ethniques. Les initiatives suivantes ont notamment été prises : référendum sur le statut politique du peuple québécois : démocratisation radicale du financement des partis politiques, excluant par la loi toute participation autre que celle des individus, avec une aide complémentaire de l’État; efforts soutenus afin d’alléger le fardeau fiscal des gens à revenu modeste et de redistribuer plus équitablement la richesse collective; régime public et universel d’assurance automobile; extension et vigueur nouvelle insufflée au secteur public de l’économie; mesures en vue de favoriser la syndicalisation et d’assurer une meilleure protection de la santé et de la sécurité des salariés; « Charte de la langue française » visant à assurer l’égalité des chances de la grande majorité des travailleurs Québécois, de langue française, tout en reconnaissant et protégeant les droits de la minorité anglophone; décentralisation de l’appareil gouvernemental et participation accrue des citoyens aux instances administratives; protection rigoureuse de l’environnement et du territoire agricole; premières tentatives de concertation des principaux agents socio-économiques; enfin une Charte des droits et libertés de la personne que nous croyons la plus progressiste en Amérique. Pour toutes les raisons que je viens d’évoquer, je formule avec confiance, monsieur le président, le vœu que notre demande d’adhésion soit accueillie favorablement par votre Bureau de direction.